1000 Poppies, Kelvin Grove Library. The 25th April is the anniversary of ANZAC troops landing on the beaches of Gallipoli in 1915. It is the day we remember all Australian and New Zealand servicemen and women who have served and continue to serve in our armed forces. 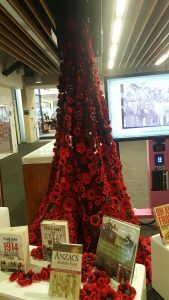 Kelvin Grove Library has made a stunning display on Level 3 near the Library Helpdesk featuring a flood of poppies hand-sewn by librarians and friends from the community. The books on display are available for loan and will be replenished each day. If you would like to know more about Anzac Day, why not visit the Australian War Memorial website or watch a documentary on one of our online streaming services? Play games for free in the library Games Lab! 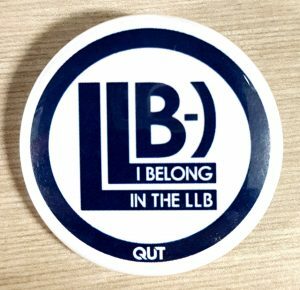 Kelvin Grove Library has been very popular with students spending their downtime in the Games Lab on level 4. The Xbox One or PS4 consoles, which are located in the Games Lab, come pre-loaded with games so all you need to do is collect the controllers from the library Helpdesk before you head upstairs to play. Coming soon to the PS4 in May – Uncharted 4. If you are interested in using an older console the Xbox 360 and PS3 can be borrowed from the Library Helpdesk, all you need to do is set them up in the Games Lab. The games on disc for all these consoles are on Level 3 of the Kelvin Grove Library at the call number range: 794.8. Happy Gaming! If we don’t have the game you want to play, please let us know. We always want to hear from students to improve our services.